The Temple Mount a hill located in the Old City of Jerusalem, is one of the most important religious sites in the world. It has been venerated as a holy site for thousands of years by Judaism, Christianity, and Islam. 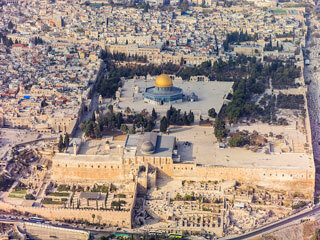 The present site is dominated by three monumental structures from the early Umayyad period: the al-Aqsa Mosque, the Dome of the Rock and the Dome of the Chain, as well as four minarets. Herodian walls and gates with additions dating back to the late Byzantine and early Islamic periods cut through the flanks of the Mount. This article uses material from the Wikipedia article "Temple Mount", which is released under the Creative Commons Attribution-Share-Alike 3.0 License.